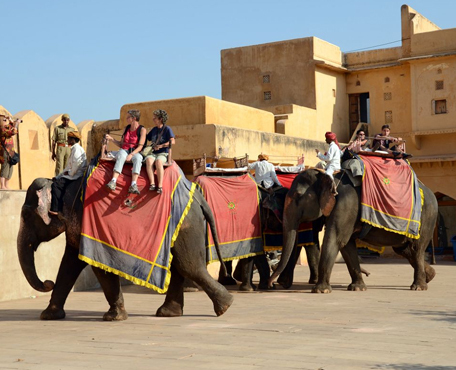 Jaipur over night tour is sufficient to discover the Jaipur which is known as for its own beauty and Rajasthani culture. More over Jaipur city is capital of Rajasthan and famous for Gems and jewelleries the biggest market of Asia. But the some heritage monument of this Jaipur increase the charm of city. In the old time it had been a battle field during the reign of Maharaja and many war fought on the land Jaipur. All the house and market covered with pink colour which is identity of Jaipur, that’s why its called by the name of Pink city. If you are arriving in Delhi and want to do the Jaipur over night tour, we can pick up you from airport or from your hotel. If you are in Agra which is nearby city this specific tour can be done from there also. We pick up you from Delhi and drive to Jaipur it takes 6 hour to reach the city, after that we show you Jantar mantar, Albert museum, hawa mahal and rest in hotel. Have the breakfast in hotel and proceed for Amber fort, here you can do the elephant ride too, then Jal mahal, city palace, jaigarh fort, some famous bazaar and drive you back to Delhi and drop you at your destination. SERVICE INCLUDING:- A/c car, driver, gasoline, parking, highway tax, state tax, etc. NOT INCLUDING:- Monument fee, video/camera, charges if any, tip to driver/Guide etc. NOTE:- You free to book you hotel, if you want we do hotel booking too according to your budget.